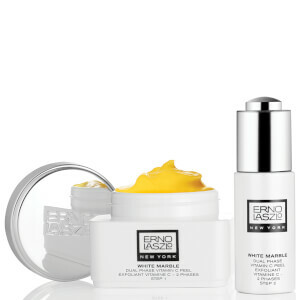 Relieve thirsty skin with The Ultimate Quench: Hydra-Therapy Starter Set from Erno Lazslo. Delivering next-level hydration, the limited edition, best-selling products work in synergy to nourish, replenish and illuminate skin. A hydrating, alcohol-free toner that delivers calming and restorative benefits while gently sweeping away dulling dead skin cells. Formulated with a cocktail of beneficial ingredients, including antioxidant Provitamin B5, soothing Comfrey Root and moisturising Glycerin, the silky toner revives the look of dull, dry complexions while kick-starting the renewal process. Free from phthalates, petrolatum, sulphates and mineral oil. A dual-phase peel-off face mask that delivers soothing, plumping and moisturising properties. Replenishing moisture when needed most, such as post-sun and pollution exposure or travelling, the revitalising face mask feels cooling on application and contains natural hydrators for intense nourishment. Promoting younger-looking, reinvigorated skin, the mask combines Provitamin B5 with Comfrey Root for antioxidant support and soothing relief of sensitivities and irritation. Refreshing and smoothing the appearance of fine lines, the plumping mask also contains Zinc extract for protection against sun damage and other pollutants. Free from phthalates, petrolatum, fragrance and mineral oil. A lightweight, silky serum to restore dry skin. With a Triple-Action Moisture Charge Complex, the formula penetrates three levels of skin to preserve and maintain optimum moisture levels. 'Moisture magnets' attract and bind moisture while preventing water loss, and protecting probiotics and super-hydrators instantly soothe and smoothen the appearance of skin's surface. Giving you the famous 'Laszlo Glow', this serum will plump up skin for a youthful appearance and leave you feeling super-hydrated with a moisturised, reinvigorated complexion. Free from phthalates, parabens, petrolatum, sulphates, fragrance, and mineral oil. A breakthrough in beauty sleep, the weightless face mask moisturises and locks in vital nutrients while you sleep. Fortified with omega-rich Winged Kelp Extract and 24-hour Smart Hydrators, including Prickly Pear and Green Ginger and Mugwort extracts, the overnight treatment helps to replenish the moisture skin can lose overnight. Its NASA-inspired memory gel texture melts effortlessly onto skin to restore and refresh skin overnight. Also contains a fruit-derived dual-action Recovery Complex to strengthens skin's defences. Wake up to a hydrated and restored complexion with youthful, healthy-looking glow. Free from phthalates, parabens, petrolatum, sulphates and mineral oil. A treatment to help awaken your complexion. Powered by the founder’s Phelityl Complex, which delivers intense moisture by blending with natural fatty acids found in the skin, the moisturiser also uses Sweet Birch and Clove Oil to gently sweep away dead cells, excess oil and bacteria for a calm and clear canvas. Melting effortlessly into skin, the bestselling “Tofu Cream” helps to plump out the face shape, leading to a reduction in the appearance of fine lines and a more youthful facial contour. Come morning, you can expect strengthened, balanced skin infused with a healthy glow. Free from phthalates, sulphates and colourants. Toner: Immediately after cleansing, sweep over skin with a cotton pad or apply directly with your hands by patting in the liquid—just be sure to avoid the eye area. Use day and night as part of your bespoke Double Cleansing Ritual. Follow with treatments and moisturisers to match your skin’s needs. Peel-Off Face Mask: Use immediately after cleansing. Pour Step 1 Liquid and Step 2 Powder into a glass. Use spatula to vigorously mix for 45 to 60 seconds, until consistency is a liquid mousse with powdery flecks. Smooth mask over the face, avoiding eye area, brows, hairline, and mouth. Goes on with a cooling sensation. Allow mask to dry for 15 to 20 minutes. Peel off mask, downward from forehead. Discard mask in waste bin. Splash the face with lukewarm water to remove any residue. 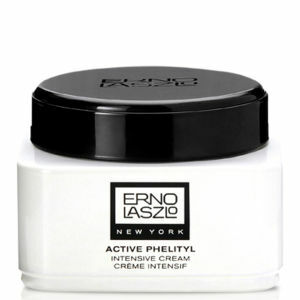 Follow with the Erno Laszlo toner, treatments, and moisturiser prescribed specifically for your skin. Serum: After toning and before moisturising, smooth over face and neck, avoiding the eyes. Use morning and night as part of your hydration treatment ritual. Sleep Mask: Immediately after cleansing, smooth over face and neck, avoiding the eyes and brows. Blot off any excess and leave on overnight. In the morning, rinse and follow with your prescribed treatments. Use twice a week as part of your hydration cleansing ritual. Night Cream: Moisturise after toning and prescribed treatments, such as serums and eye preparations. Gently apply with fingertips, blending upwards and outwards from the middle of the face, then along the neck and décolleté. Toner: Water (Aqua/Eau), Glycereth-26, Glycereth-7, Panthenol, Sodium PCA, Allantoin, Polyacrylamide, Parfum (Fragrance), Propylene Glycol, Diazolidinyl Urea, Methylparaben, Disodium EDTA, Citral, Geraniol, Citronellol, Linalool, Ci 19140 (Yellow 5), Ci 15985 (Yellow 6), Ci 61570 (Green 5). Peel-Off Face Mask: Step 1: Water (Aqua/Eau), Glyceryl Polymethacrylate, Panthenol, Allantoin, Propylene Glycol, Methylparaben, Benzyl Alcohol. Step 2: Magnesium Carbonate, Algin, Silica, Calcium Sulphate, Pentasodium Triphosphate, Ci 77491, Ci 77492, Ci 77499 (Iron Oxides), Ci 77947 (Zinc Oxide). Serum: Water (Aqua/Eau), Pentylene Glycol, Polysorbate 20, Hyaluronic Acid, Silanetriol, Rosa Canina Extract, Aloe Barbadensis Leaf Extract, Bifida Ferment Lysate, Milk Protein (Lactis Proteinum/Protéine Du Lait), Lactose, Sodium PCA, Caffeine, Sodium Hyaluronate, Sucrose Palmitate, Glycerin, Caprylic/Capric Triglyceride, Butylene Glycol, Tocopheryl Acetate, Glyceryl Linoleate, Acrylates/C10-30 Alkyl Acrylate Crosspolymer, Disodium EDTA, Citric Acid, Sodium Hydroxide, Potassium Sorbate, Sorbic Acid, Benzyl Alcohol, Caprylyl Glycol, Hexylene Glycol, Phenoxyethanol, Red 4 (Ci 14700). Sleep Mask: Water (Aqua/Eau), Dimethicone, Glycerin, Butylene Glycol, Peg-240/HDI Copolymer Bis-Decyltetradeceth-20 Ether, Caprylic/Capric Trigylceride, Phenoxyethanol, Dimethicone/Vinyl Dimethicone Crosspolymer, Polyglyceryl-3 Methylglucose Distearate, Dimethiconol, Chlorphenesin, Ethylhexylglycerin, Sodium Polyacrylate, Hydrogenated Polydecene, Disodium Edta, Parfum (Fragrance), Alaria Esculenta Extract, Citric Acid, Trideceth-6, Potassium Laurate, Tocopherol, Artemisia Absinthium Extract, Artemisia Vulgaris Extract, Solanum Lycopersicum (Tomato) Leaf Cell Culture Extract, Ci 16035 (Red 40), Opuntia Ficus-Indica Stem Extract, Rubus Idaeus (Raspberry) Leaf Extract, Opuntia Ficus-Indica Leaf Cell Extract. Night Cream: Water (Aqua/Eau), Glyceryl Stearate, Dimethicone, Peg-8, Cetearyl Alcohol, Paraffinum Liquidum (Mineral Oil/Huile Minerale), C10-30 Cholesterol/Lanosterol Esters, Caprylic/Capric Triglyceride, Ppg-10 Cetyl Ether, Petrolatum, Ceteareth-20, Magnesium Aluminum Silicate, Imidazolidinyl Urea, Carbomer, Methylparaben, Sodium Hydroxide, Propylparaben, Parfum (Fragrance), Benzyl Salicylate, Citral, Coumarin, Eugenol, Hexyl Cinnamal, Hydroxycitronellal, Isoeugenol, Limonene, Linalool, Caramel. I was talked into getting this set by a Lazslo representative at a beauty event and it sat under my counter for several weeks before I finally opened it up and started playing. I've never used Lazslo before and didn't have huge expectations, but wow! I love everything I've tried and have incorporated several pieces into my normal routine. My skin has always been oily but is starting to get dry and sensitive outside of my t-zone. I didn't realize how dehydrated it was until I started using this set and my face started drinking everything in and glowing. I've been stopped several times by strangers who compliment me on my gorgeous skin, which is a huge shocker to me. Best yet, my oilier problem areas haven't broken out or gotten greasy. The toner is AMAZING- no need to use a cotton pad, I just sprinkle a little on my hands and pat it in. I used the jelly sleep mask on a plane ride and my skin was dewy and comfortable when we landed. This is such an amazing deal- you get several good size pieces to play with and a little goes a long way. I've been using the toner day and night for almost a month and I still have 1/2 the bottle left. Highly recommend!